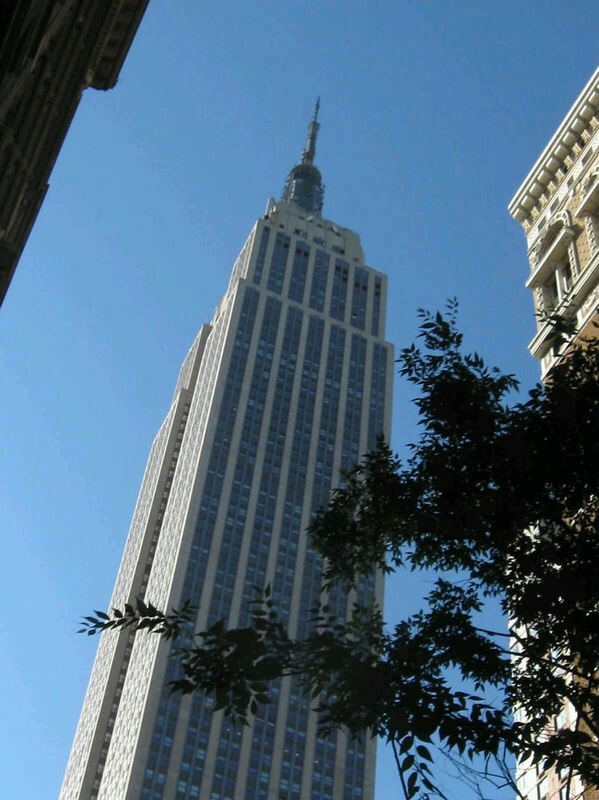 Our 2011 Road Trip #17: The Empire State Building on $0.00 a Day « Midlife Crisis Crossover! That precious sight everyone treasures whenever they find it in Manhattan: a real live tree. Because every tourist is required to check in at King Kong’s favorite scratching post, pretend old-fashioned romance awaits us on the observation deck, and then run like crazy before Roland Emmerich finds six more ways to destroy it while we’re in striking distance. DAY SIX — Thursday, July 14, 2011. We awoke to the morning news of a group shooting in Newark. Nice to know our old stomping grounds hadn’t changed since we left. Once again we watched several #159 and #156 buses drive by — including one #159 driver who kept staring and waiting until he grew tired of us not responding and moved on — before a #158 showed up and escorted us across the river. Jersey to Port Authority, quick jaunt from there to the Times Square subway station, picking up another fresh-made breakfast-cart sandwich (happiness is an accented morning greeting of “Salt-pepper-ketchup?”, albeit interrupted by a rude customer upset that they charged a quarter more for bottled water than some other cart across the street), one crowded rush-hour ride (where Anne insists one jerky stop made my son fall backward into me, causing me in turn to crush a lady behind me, but I have no recollection of this event or victim) over to 34th and Herald Square. Times like rush hour made me appreciate the fact that I never personally had to drive in Manhattan all week long. We were at last in the presence of the most mandatory Manhattan stop of all. My wife took the shot since I avoided it out of some deranged sense of tourist elitism. Then I realized that it has the same initials as The Empire Strikes Back and wished that I’d beaten her to it after all. Now with a value-added touch of Batman ’66 cam-tilt. Without a paid ticket or a good reason to be admitted, this is as far as you get before a doorman treats you as an intruder. Doormen in TV and movies always seem like such nice guys. 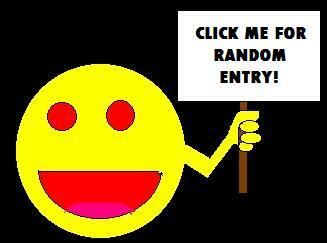 In reality, they will eject you if you’re not the hero. And your little family, too. We had agreed unanimously the other day that the Top of the Rock was all the elevator action we would need this year, so we opted out. Several dozen would-be tour guides surrounded its perimeter and shared a hivemind disbelief at our refusal to enter. 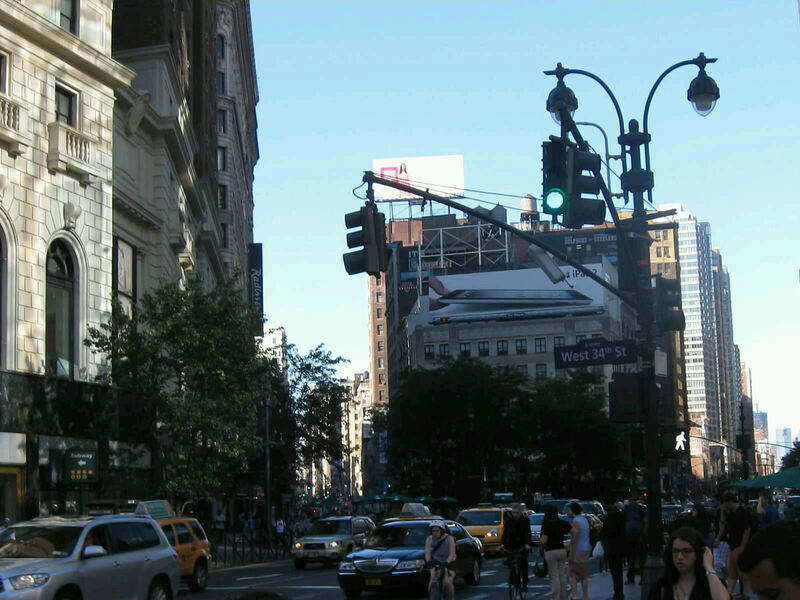 As we walked east on 34th Street, away from the 5th Avenue entrance, one of them helpfully shouted, “YOU GOIN’ THE WRONG WAY!” I realize some people need practical advice, but we knew what we were doing. Well, sort of. Due to severe miscommunication, contradictory expectations, and my wife’s predilection for smashed penny machines, this morning’s group meal wound up an almost-overpriced breakfast at the Sbarro on West 34th. We’ve had the occasional Sbarro franchise in our Indy malls, so suffice it to say this was once again a case of us not on the lookout for culinary exotica. It was still an improvement over the Hard Rock Cafe, I’ll admit in hindsight now that everyone’s stabbing impulses have well subsided. Italian fast-food chains aren’t the only businesses at the base of the ESB that are particular in which products they choose to showcase. 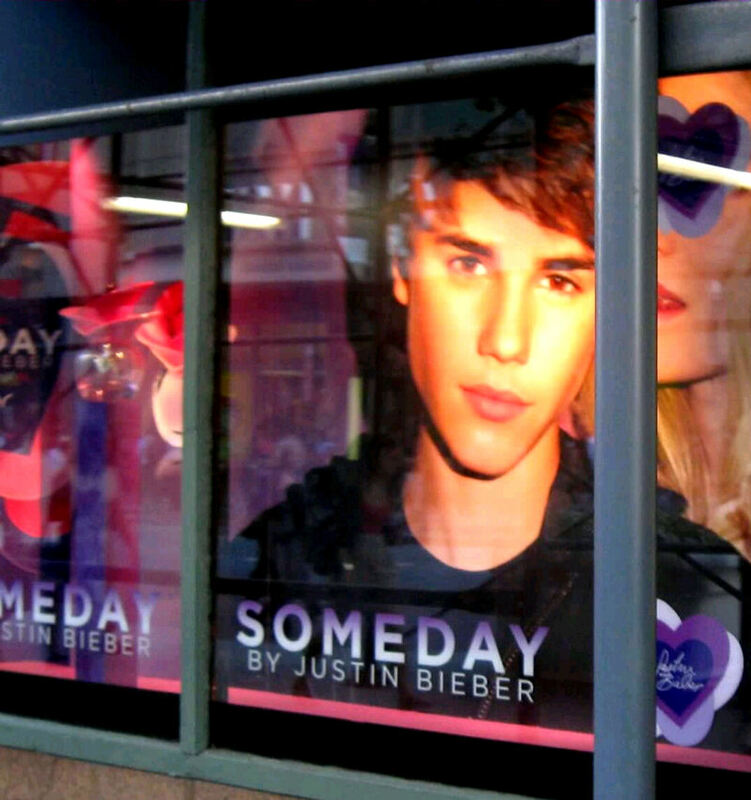 Now you too can smell like a 17-year-old kid. 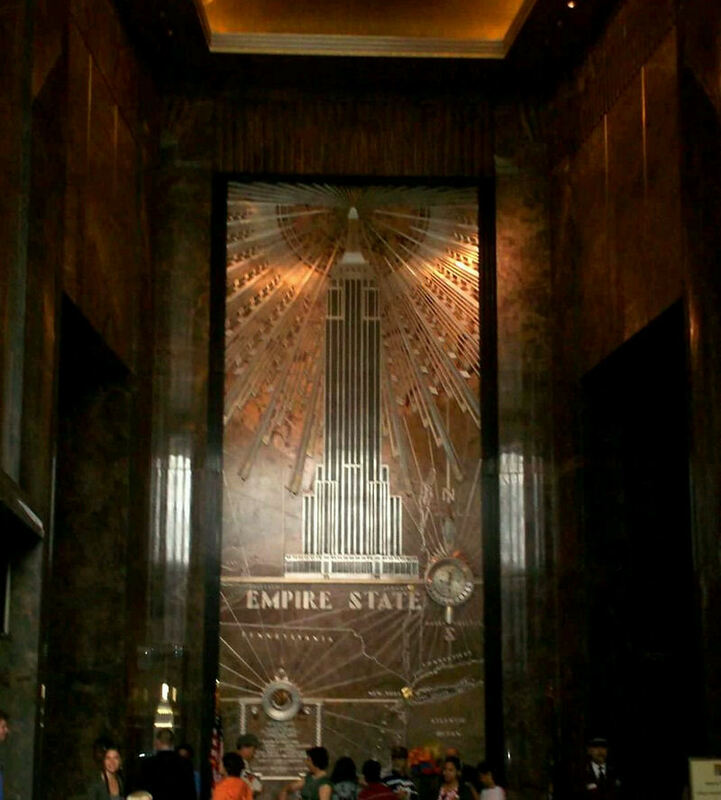 We did go so far as to step into the ESB lobby, just to look. It was early and the line was short, but we still declined to take a ride. If the elderly, eastern European doorman wasn’t cranky before we entered, we sure made him as much. To him, gawking and loitering were next to ungodliness. While Anne snapped a pic and I tried to peek inside their gift-shop closet, he kept sniping at us every time we stood in a wrong place. His lobby was subject to a very strict placement system in his head, none of which I could fathom. Now having officially experienced the ESB as much as we felt we needed to, we fled his jurisdiction and headed west. 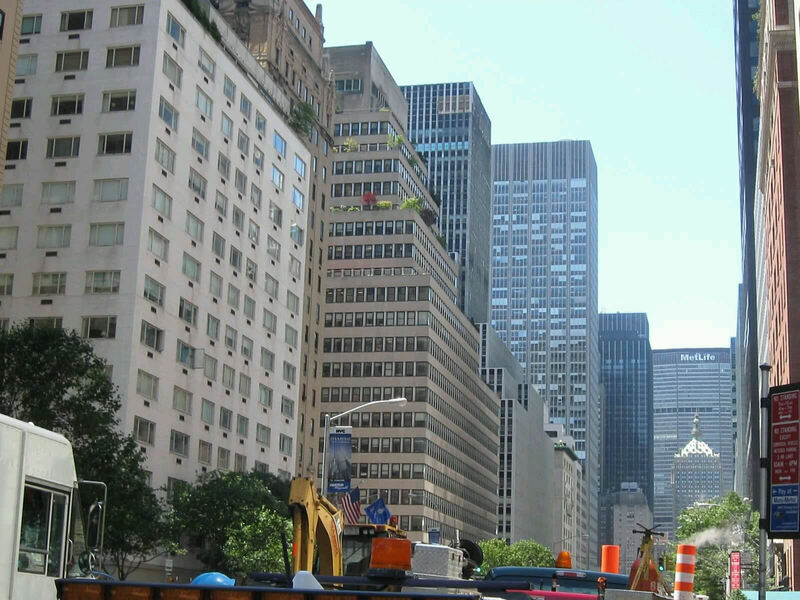 We took a few photos of random stretches of Midtown during our walk. We’re tourists. This is who we are and what we do. Hey, kids! 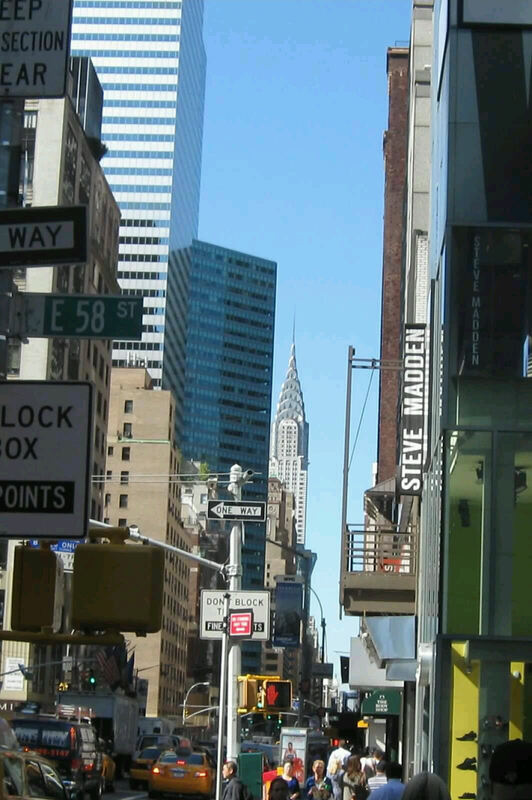 It’s the Chrysler Building waaaay over there! Remember MetLife, the company that somehow lured Charlie Brown and the Peanuts gang into a life of TV shilling? That’s their house past all those interchangeable boxes. 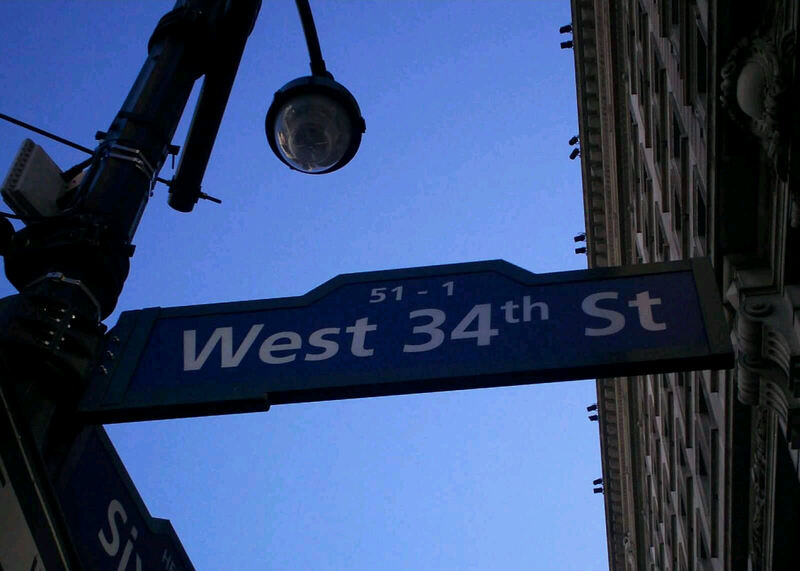 Photo #3 in Anne’s “Street Signs of New York” miniseries. Another reason we didn’t dwell there was our 10 a.m. appointment at the Sony Wonder Technology Lab, which required jumping back on the subway and jumping off again at 5th and 53rd, followed by a few blocks’ walk up and over to Madison Avenue. 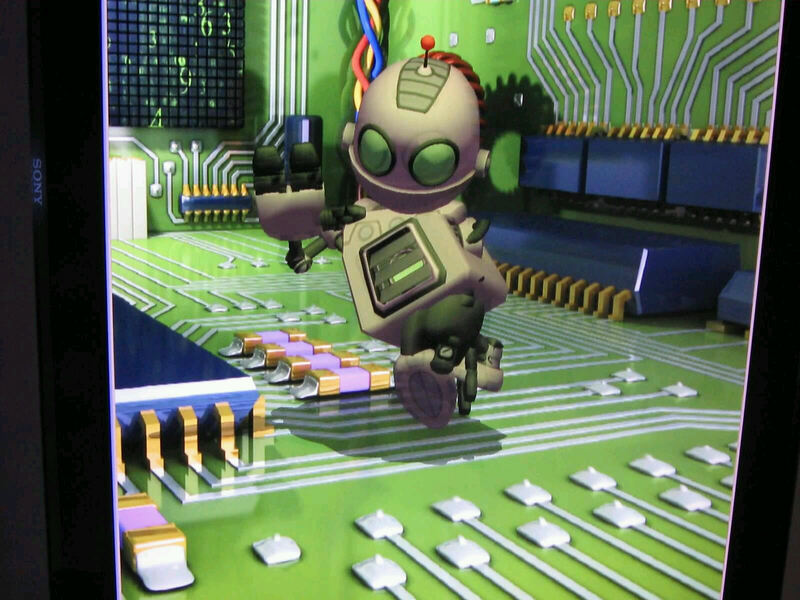 The Sony Wonder Tech Lab is a free (but timed-ticket) tour of hands-on demonstrations and stations showcasing assorted advances in computers, gadgets, gizmos, and toys. On paper this sounded like a diversion right up my son’s alley. Alas, we were eight years too late. The Sony Wonder Tech Lab worked great for all the younger kids in attendance; the older jaded one we brought with us, not really. My computerized tally sheet at the end of the tour verified that I participated in three times as many exhibits as he did. Prime example: Clank became my very own PlayStation Move dancing puppet. …until one of my lightning-fast dance steps somehow confused the sensors and caused my groovin’ alter ego to lock up. I guess they haven’t built the hard drive that can keep up with this rhythm. The most amusing demo gave visitors the opportunity to play Hollywood film editor and create our very own movie trailer from pre-selected video clips, sound effects, and title cards. Our best result was a buddy picture called Strangers in Danger, in which Peter Parker and Stuart Little teamed up against the menace of Captain Hook. I’m positive there was at least one explosion, the bare minimum that every movie requires. This exhibit provided us with slightly more creative control than some big-studio directors are afforded. Too bad we couldn’t take a copy with us to show off at our Hollywood pitch meetings someday. 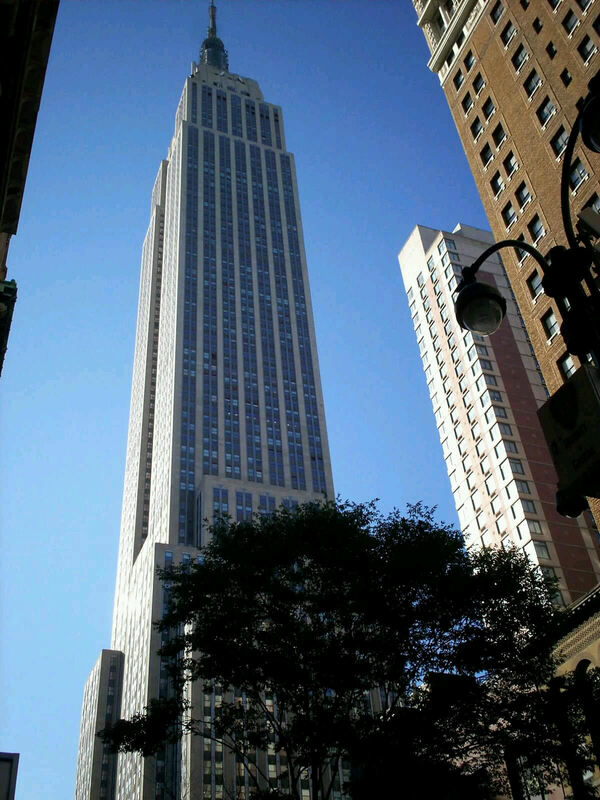 Naturally the final cut of the production based on our pitch will tack on a hackneyed climax at the Empire State Building against our wishes. That’s showbiz. 1. Now that I’ve played Bioshock and its first sequel, all art deco reminds me of Andrew Ryan and Rapture, including that ESB lobby. How much wilder would that photo be with an angry Spider Splicer crawling across the upper wall? 2. Remember when PlayStation Move was almost a thing for about ten minutes? Ah, those idealistic times.